Welcome to another session of Major Williams' Gundam Building 101 series. I'll be showing you this time the steps needed to ensure that your paint will stick to the pieces you're going to be painting. Using my nub management guide, I cut out and sanded all the runners and put them into plastic bags. 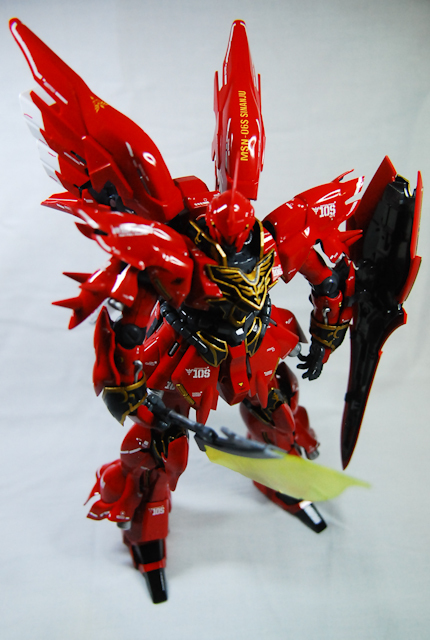 This took about a week or two because of finishing the Sinanju and other time commitments. 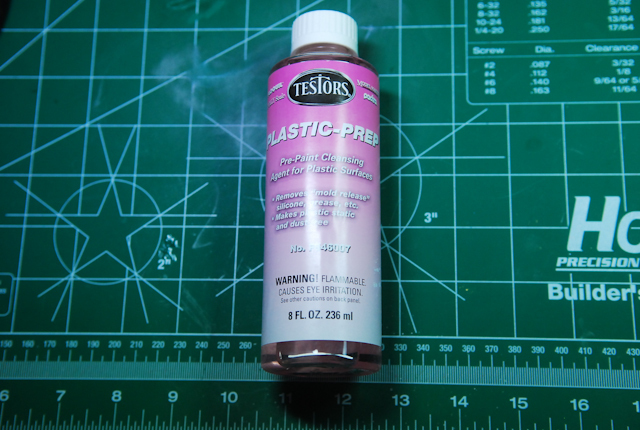 To make painting a little easier, and the whole process more complete, I am using Testor's Plastic Prep (~$7.50). It will release the molding agents, oils, static and dust that the pieces naturally accumulate over time so it can hold paint better. Good stuff - and you can really tell the difference after using it. 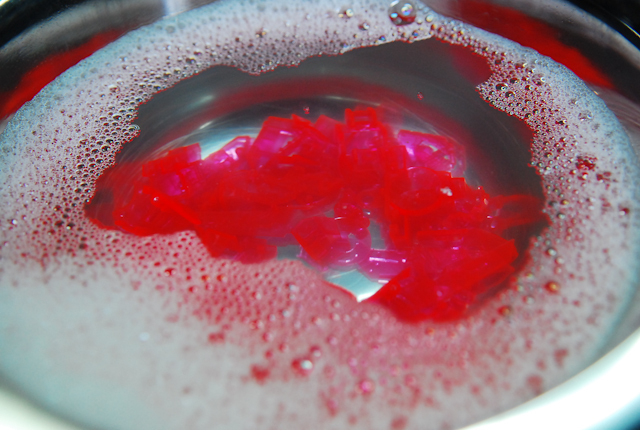 First, you have to wash your parts for 10 minutes in warm soapy water. Let them dry completely, and while that's being done, put some of the Plastic Prep into a container - I like to use glass candle holders - they're around $1 at Target/Wal-mart, and are the perfect size for this and holding paint. Dip each of the parts completely in the solution. 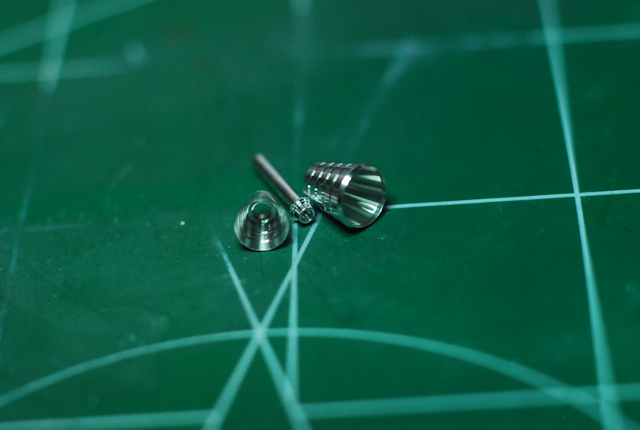 If you have larger parts, or don't want to dip, you can use a Q-tip and wash the surface of each piece (more tedious, but perfect for larger pieces). The instructions say to let it dry completely without wiping it off. 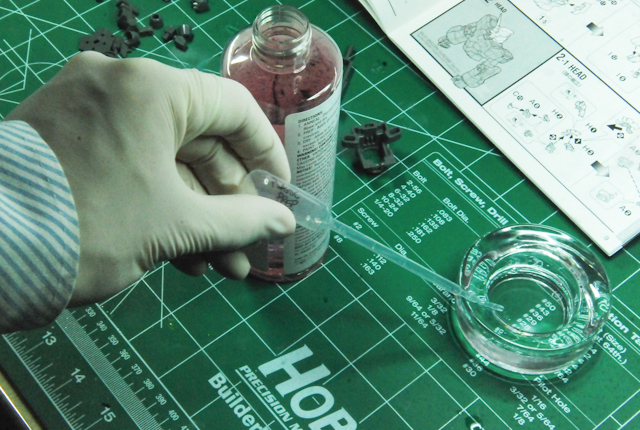 It takes quite a while if you dip your parts - nearly 20-30 minutes! If you use a Q-tip, the drying is within 5 minutes. 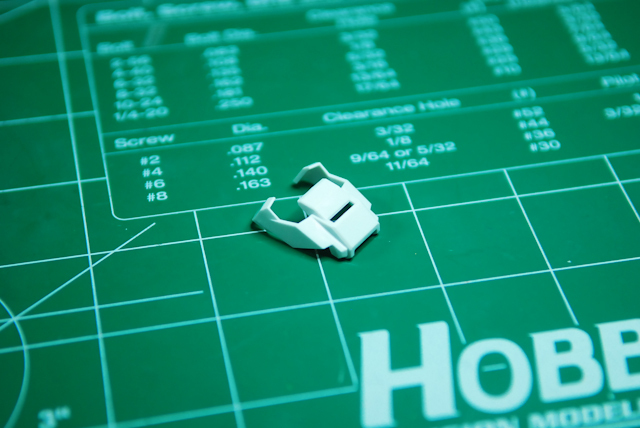 Using a pin vise, your hand, or an actual drill, exercise the holes where your parts will fit into the underarmor. If you are painting the underarmor too, exercise those holes as well. 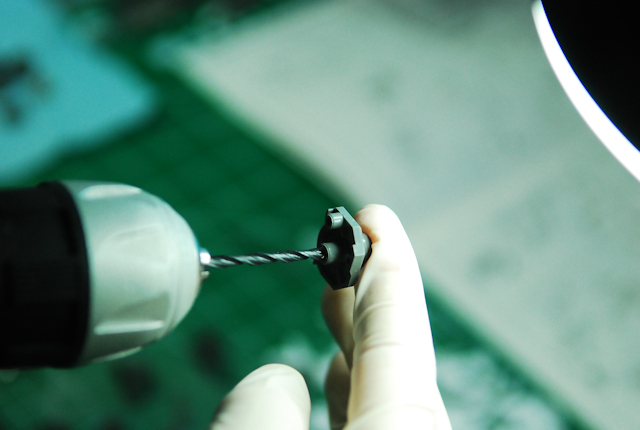 Make sure you use a drill bit that is slightly larger (only by a little bit), and don't make the hole too big either. 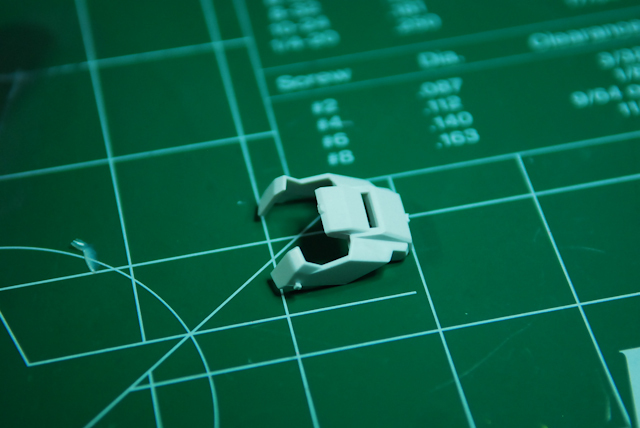 Your goal is to make the piece just loose enough to be able to fit into place and easily be taken off. Here I'm using a drill. Sometimes, some holes are too big with the drill bits I have on hand and I don't feel like getting others, so I gently drill (slowly), and move the bit in a circular motion around the hole to shave off some of the plastic. Easy peasy. 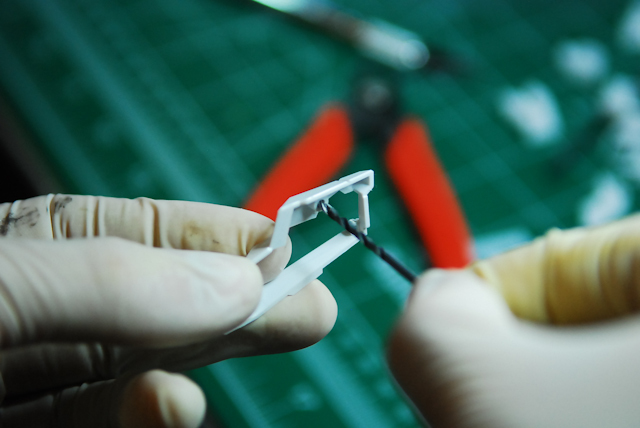 Once these two processes are done, you can then begin assembling your model! 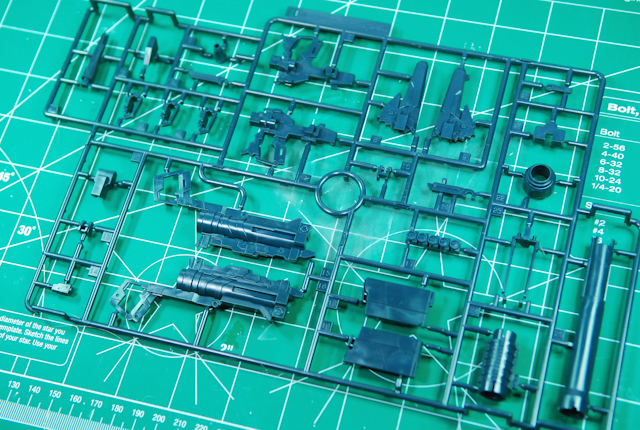 Keep in mind you are only putting it together to get an idea of what everything looks like - you WILL be disassembling it again to paint/panel line. Assembly shouldn't take too long here either, a few hours max! 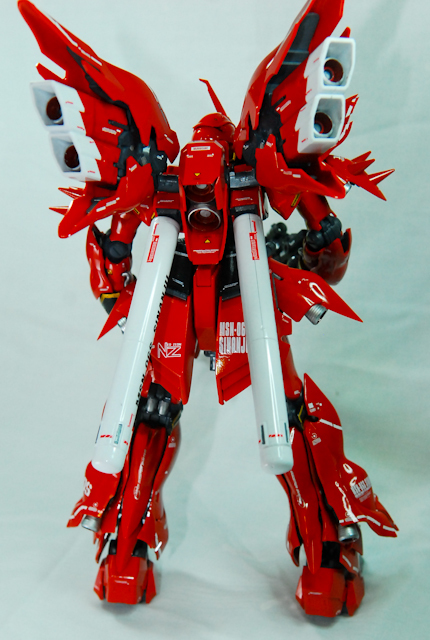 I had seen this done on a model making show, and the guy used this technique to frame up how he was going to draw panel lines and to see what he was going to paint. Total pro technique. Once he was finished with his model, he just glued the non-moving parts into place. Hope this helps! Will post soon with my Unicorn update! I'm calling this nub management because that's really what I'm going to be showing you how to do this entire time. I'll have pics here, and a brief description of what is going on underneath it. Make sure to pay attention to the lessons learned sections (bolded for convenience). This is what's called a Runner. 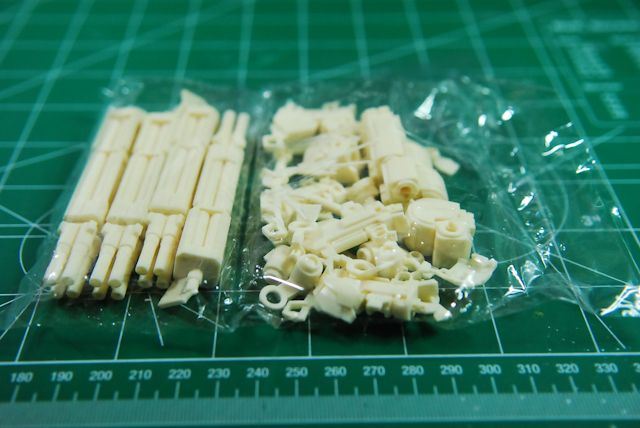 It is the plastic framework that the model pieces are molded into. The part that connects the actual piece to the runner is what is called a gateway. 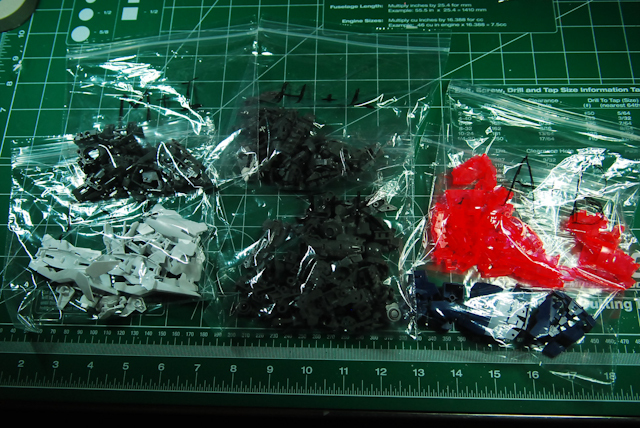 When you first open the plastic glory of your Gundam, it is near overwhelming how many runners can be in the box. 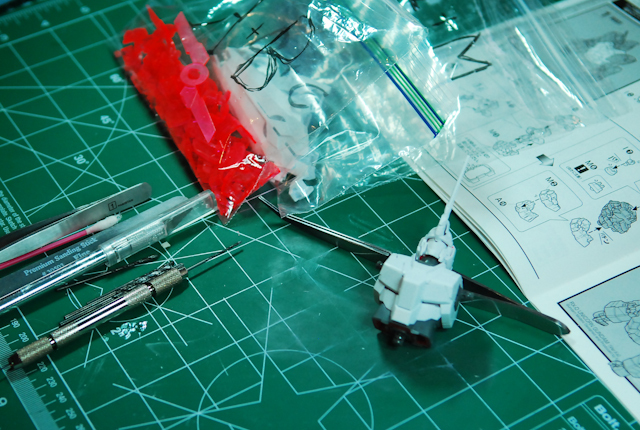 This guide is for a relative newbie, someone who's made maybe 1-2 gundams, or someone who needs a refresher or different perspective. 1. Read the directions. 3 times. Each frame. No joke. It's not as fun the second and third time, but you see how the parts fit together and what goes where so that when you ARE cutting out pieces, you won't screw up and understand kind of what it is for. 2. 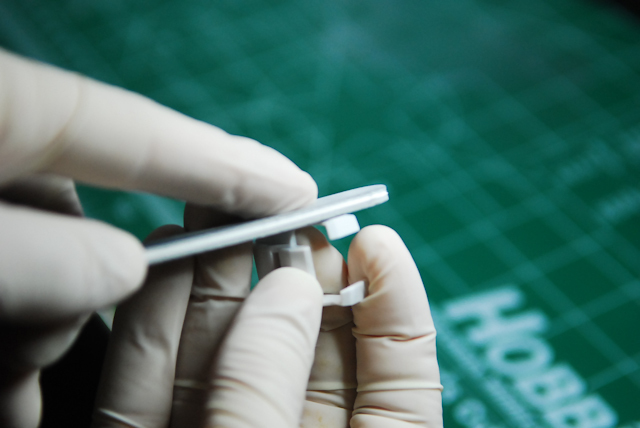 Put on your gloves, and get your materials ready for cutting out 1 runner. 3. Cut out your first piece. 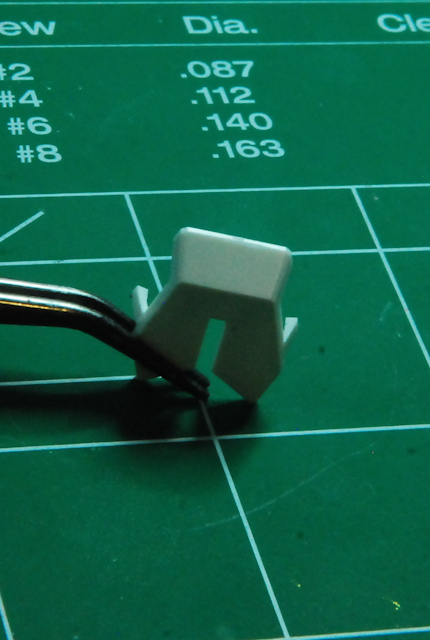 Make sure you cut AWAY (not adjacent) from the piece and more on the gateway by about a couple millimeters (as shown). I like to minimize work, but if you don't have a steady hand you can just cut off in the middle of the entire gateway. 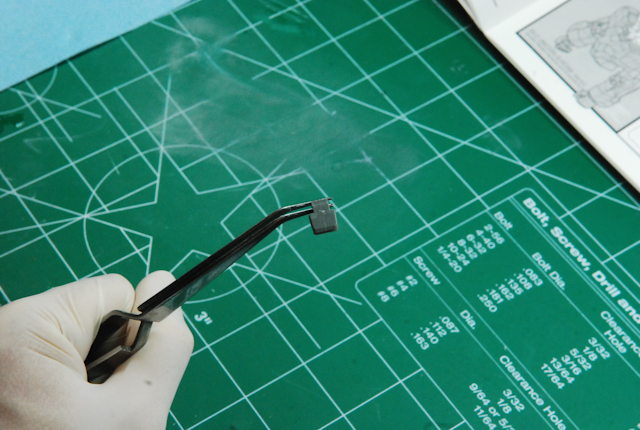 Do not try to cut as close as possible to the piece, this precision work is for the exacto knife later on. Proceed to cut off the entire Runner in the same fashion, and pile them on one side of your workspace. 4. If you elected to cut the middle of the gateway, cut the nubs down so that they're only sticking out about a few millimeters. Lesson learned: do NOT let the leftover nub sticking out exceed more than a few millimeters (in fact, in this picture, looking back, I think the nubs are almost too long haha). If it is long, it can cause the nub to snap off, which will give a bad result. I will talk more about this later. 6. 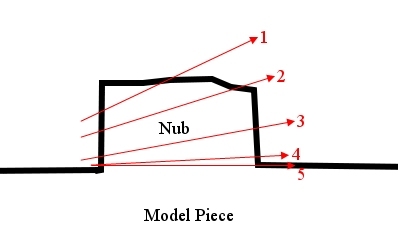 As you get down to the bottom of the nub, have your knife run parallel to the surface the nub is on and carefully shave in light strokes across the surface of the nub. If you press too hard, you will begin shaving outside of the area the nub is on. 7. Using your airbrush/toothbrush, brush away the excess shaved plastic to get an idea of what the piece looks like without the dust all over it. 8. 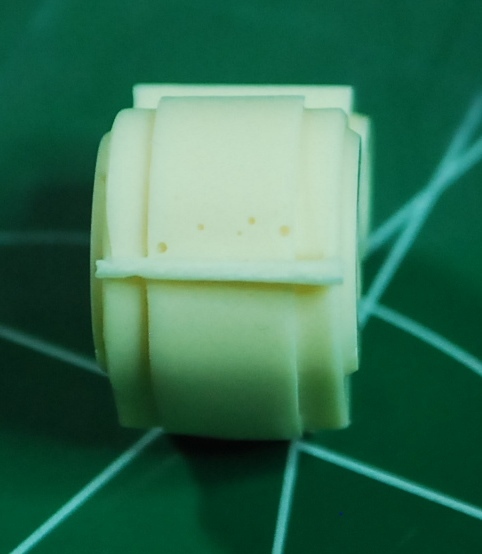 If your nub has snapped, which you will have occasionally, you'll get a result like this: plastic that appears warped and lightened because of the stress on the plastic. If not, it will be ready to go, like this! 9. 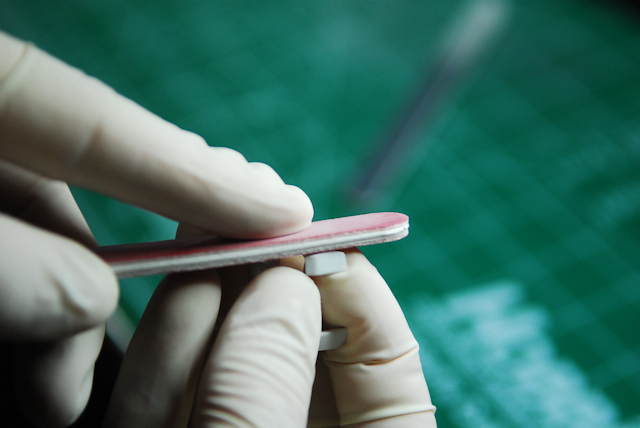 Sanding: I use sanding only if I am painting as a rule of thumb. If you aren't, sanding is a better option for white parts only in my experience, but with the right amount of care, you can sand anything and make it look pretty good. Using a rougher grit (my sandpaper says "Fine", but its around 4-600 grit), carefully sand parallel to the surface your leftover nub is on. Your objective here is to get rid of all rough edges, or evidence of warped plastic. Be careful not to bleed over into other areas of the piece, as you'll have to go over it again with the lighter sandpaper. A note about warped plastic: if you are painting, and where your nub was is perfectly flat, but with evidence of warping, leave it. The paint will cover that up! Don't bother sanding if it's not rough. 10. With your finer grit sandpaper (800 and higher recommended), sand over the areas to smooth out your scratch marks with the previous sandpaper. I personally recommend the nail file type ones because it is easier to handle. 11. If you want to buff the scratches (if you're not painting), you can use buffing compound and a terry cloth/painters towel. I didn't do it here because I'm painting this model, but it will get rid of some of the scratches, or alternatively you can use a super high grit sandpaper (1500 and higher). 12. You are done! All that care just for 1 piece. 13. Once you have finished all pieces, label a sandwich bag with a sharpie and put the pieces in there. I put 2-3 runners in a bag to save bags, and - this is where reading the guide comes in handy - put them in according to the sections they belong to. An entire runner should take 30-45 minutes (depending on the size). It's important to have a repository for all of your pieces once they've completed a phase so it is easier to manage; i.e. if you have finished exacto-ing a piece, put it in a tupperware/shoebox lid/whatever or even a separate area on your working surface, and when you are all done with that phase, dump the pieces back out. Please refer to my guide that is going to be coming out - Tips for Painting - Exercising Fitting Holes and Proper Cleaning. This is for people who will be painting their model using my techniques. 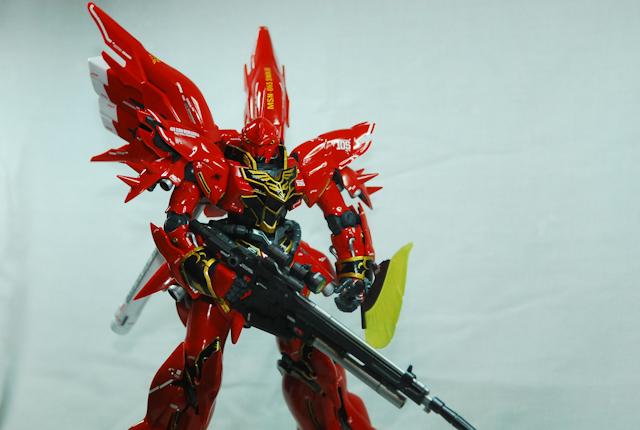 So I finished my MG Sinanju! Took ~6 weeks, and it's my second serious model build since I started back up! 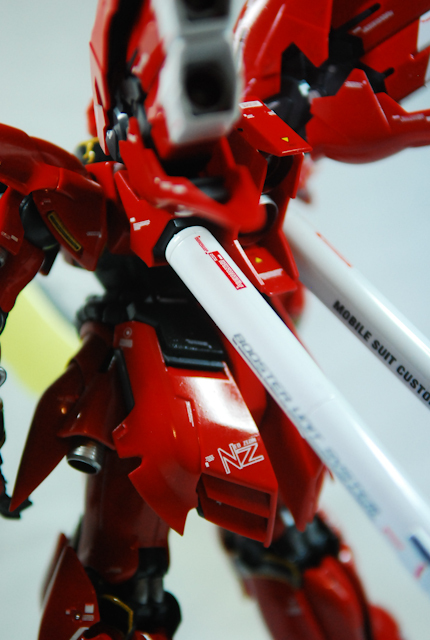 Putting Tamiya's clear coat over made the paint melt over the decals. Lame. - The body parts fit REALLY tightly together. Do not recommend painting the body, otherwise, strip the paint from the actual joint parts. Overall, it was a fun build, made some noob mistakes, but the end result is very presentable I feel. Going forward, I'm hoping to make top notch models from here on out. 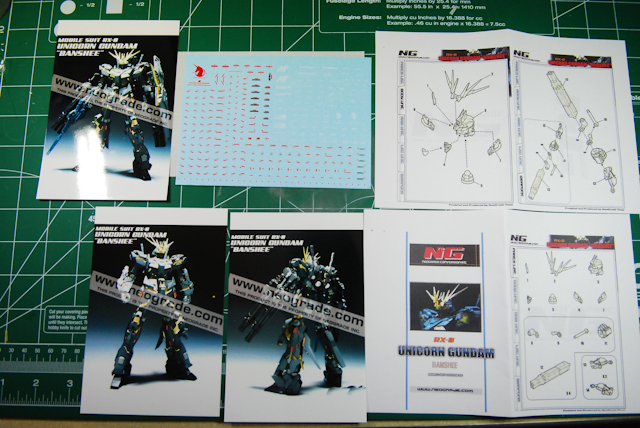 Unicorn Banshee Conversion Kit arrived! So my Banshee conversion kit came in the mail today! 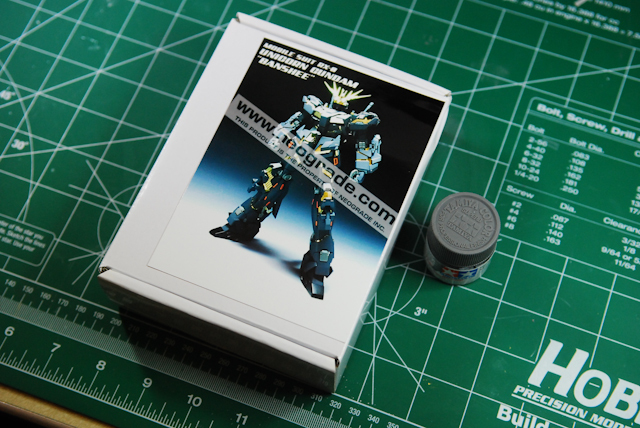 I ordered it from Tatsu Hobby, along with some other items - a clear base, and some SAGE Sinanju Decals and SAGE screws. Firstly, a review of Tatsu Hobby - I ordered this on a Friday, so I was expecting to not receive it for some time. But after I had seen that my order was still "Processing" on Wednesday (yesterday), I emailed support. I got a reply within an hour saying that they were waiting for the shipment of Banshee conversion kits to come that day, and my kit would be in the mail. Last night I got a shipping notice, and I got it today! What great customer service - they even shipped it priority for me free of charge. I give them 5 out of 5 stars, easily. Here are some pics of my Neograde Banshee conversion kit. It was smaller than I expected it to be! I put the Tamiya paint in there for reference. - I have to remove some mold binders - I was not aware I had to do this on resin kits, but now I do. - I really only bought this kit for the head. I am not too excited about the gatling guns, honestly. They seem a bit ostentatious to me. 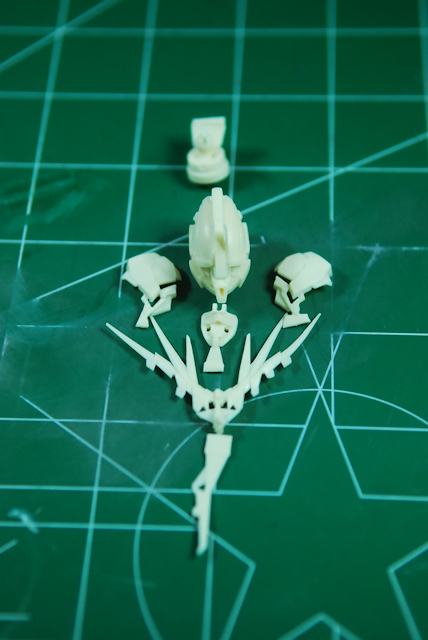 ^^ You can see some of the parts I have to cut off. Frankly I'm scared because I've never worked with resin haha. 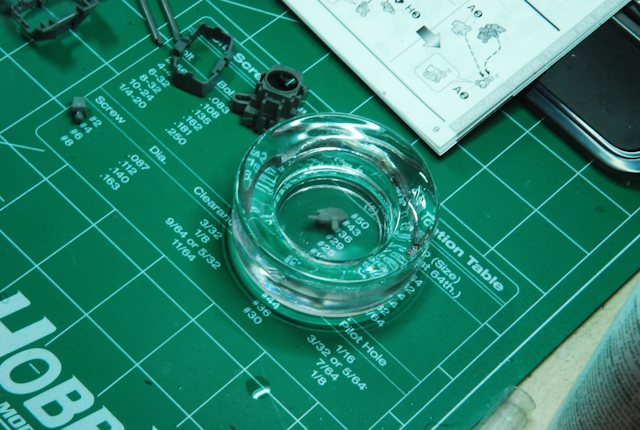 ^^You can see the resin holes created by bubbles in the casting process. I'll probably have to go to the store and get some stuff to fill it in... lame. I started this to document some of the nuances of two of my hobbies - video game playing and the building of Gundam models - also called gunpla. I currently help run a website for Halo fans called Grunts R Us. It's mainly designed to provide updates for the average Halo fan. I'll be discussing some of the more refined points and challenges with the Halo Universe that I have here. 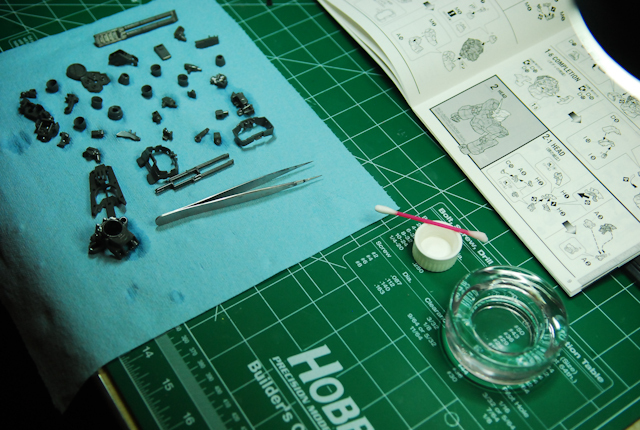 Another thing I hope to accomplish here is to document the gunpla building process. 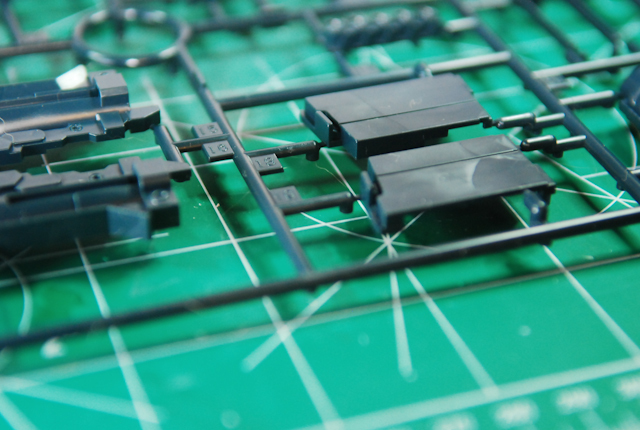 Like me, I know for a fact there are others who stumble across blogs or websites with fantastically built kits (i.e. 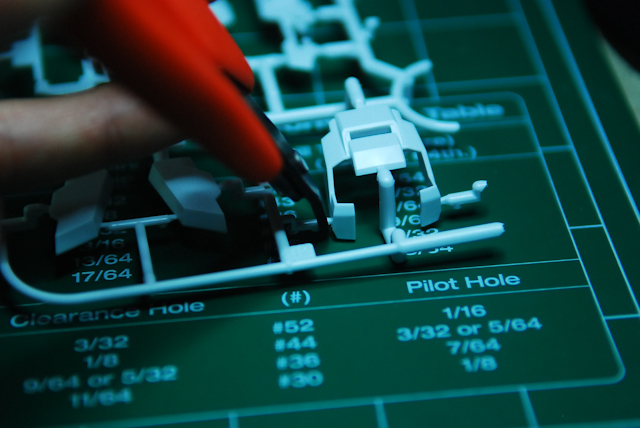 Danny Choo, NgeeKhiong, No More Robots, Neograde, or multitude of others), but ultimately have no clue where to start and have to figure out by trial and error (largely) how to make a fantastic looking kit. I'll go over the basics to the advanced techniques. I'm still learning too, and I'll post my lessons learned and my MISTAKES!!! I think it's important to to not just see the good things, but also the bad things and learn from them.